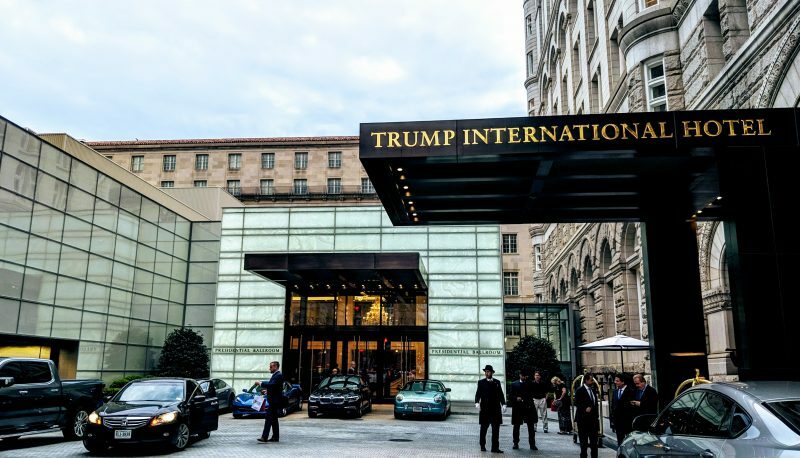 An event billed as the “Deplorables Tour” debuted in the Trump International Hotel’s Presidential Ballroom on Saturday. 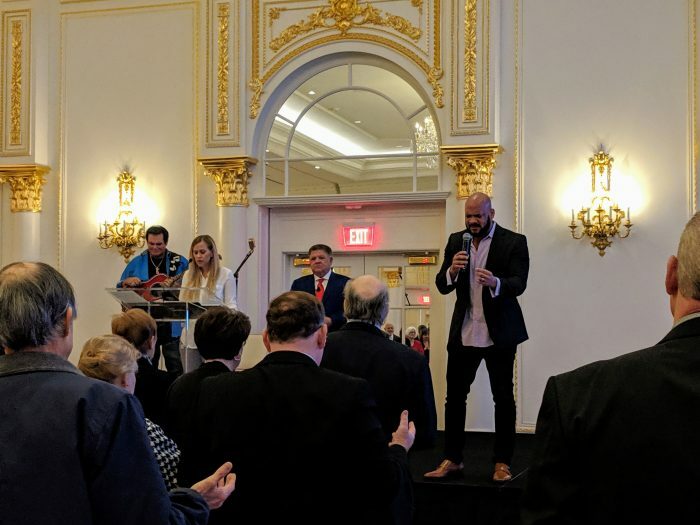 The event promised “comedy, music, awards, and speakers,” but quickly pivoted into a Christian revivalist worship service, with audience members stretching their arms upward and a speaker preaching while knelt over on the ground, crying about his love of Christ. 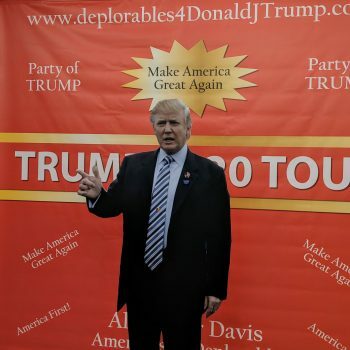 Alexander Davis, who calls himself “America’s #1 Deplorable,” hosts the Deplorables Tour. The title is a nod to comments that then-candidate Hillary Clinton made on the 2016 campaign trail in which she referred to the “racist, sexist, homophobic, xenophobic, Islamophobic” voters that Trump’s campaign courted as a “basket of deplorables.” In response, Trump supporters attached the “deplorables” label to their movement with pride and wear it as a badge of honor to this day. 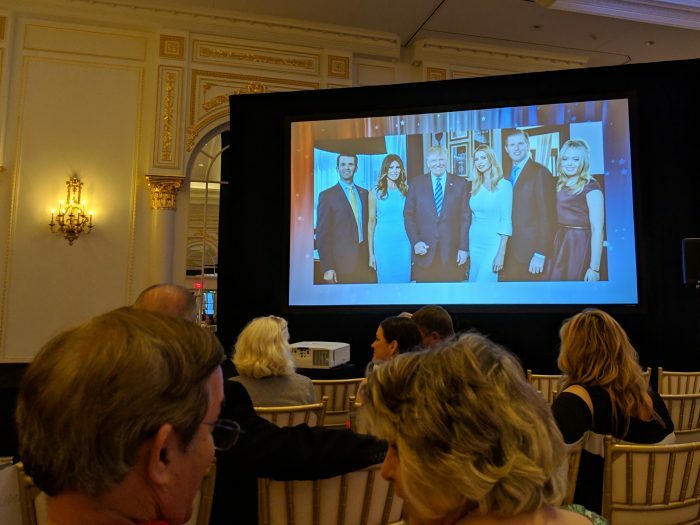 Last week, Davis told WMAL that the event was “just going to celebrate the party of Trump, telling the radio hosts that “it’s gonna be a hoot.” On Saturday, more than 100 people donned formal attire and meandered past tables selling raffle tickets and books, stopped to take photos with a cardboard cutout of President Trump, and seated themselves in a ballroom beneath a jumbo projection screen displaying a slightly pixelated image of the president’s family; lights colored red, white and blue splashed on the ceiling. Ticket-holders could chow on slices of two-tiered white sheet cake and drink Coca-Cola from small glass bottles. Some attendees claimed to have traveled more than 1,000 miles to attend the event. What followed was a set styled as stand-up comedy and performed by Davis, whose jokes had a pro-Trump bent. He received much applause for that line. Davis’ routine also had other political messages that echo claims made by the Religious Right. At one point in his opening set, Davis claimed that Trump “had an encounter with God” at his self-named skyscraper in New York City. In another part of his routine, Davis cited Reps. Alexandria Ocasio-Cortez and Ilhan Omar as examples of why women should not be involved in politics. “Liberals keep looking for ways to be offended, and I keep looking for ways to offend them,” Wheeler told the audience. The religious messaging continued when Lauren Witzke of Delaware took the stage to talk about her recovery from addiction to heroin and methamphetamine. She said she worked for a pharmaceutical company and learned firsthand of the industry’s over-zealousness in prescribing medication, which contributed to the country’s opioid crisis. She pivoted to arguing that most narcotic drugs are imported into the U.S., saying that is a reason why Trump should build a physical barrier at the U.S.-Mexico border. Witzke said that building a wall was in accordance with God’s will and that Trump had been anointed by the Lord. “There has been an assignment to wipe out my generation, but I will not stand by and let this continue. … Our God is a God of order. God establishes the borders of nations. Our nation is built on biblical principles. And there is an agenda for decades to dismantle the unity of our people and to provoke chaos,” Witzke said. “Amen!” one gentlemen in the crowd yelled, prompting applause. David J. Harris Jr. took the mic as the keynote speaker who got top billing. Harris has been a guest on the Fox Business Channel, and has more than half a million people following him on Facebook. Harris said that he recently had a conversation with former Immigration and Customs Enforcement Director Thomas Homan in a Fox News green room where, he said, Homan told him that recently departed Homeland Security Secretary Kirstjen Nielsen was the reason why he left ICE. Harris said that Homan told him that he “very well could” get a call from Trump to replace Nielsen. Harris started his talk by thanking Jesus for Trump’s victory over Hillary Clinton in 2016 because if Clinton had won, he surmised, the United States would likely resemble the U.S.S.R. by now. He went on to share his experience gaining notoriety on social media and visiting the White House with a group of young black activists, going on to ask the crowd if they were Christians. Getting an affirmative response, he delivered a lengthy sermon. By the end of his speech, Harris had fallen to his knees, crying and thanking God for his blessings while music played. Attendees raised their hands in worship and yelled out affirmations to Harris’ sermon—all while that pixelated image of the president’s family gazed down upon the crowd. Two hours after the event had started, it concluded. Davis said that the crowd had just witnessed a “Trump rally turned revival.” It was hard to disagree. But if anyone in the crowd was bothered by what amounted to a bait-and-switch, there wasn’t much evidence of it. Given that Trump’s most loyal and energetic supporters are conservative evangelical Christians, it’s not a huge risk for someone promoting a pro-Trump event to figure that it will be a friendly crowd for a Christian message. Indeed, Trump supporters have been hearing since the start of his campaign from Religious Right leaders who say that Trump was anointed by God and is being used by God to bring America back to him. Davis said that he plans for many future events and hopes that his show will contribute to the spiritual reawakening of the United States under Trump. Many Religious Right leaders are praying fervently for a new “Great Awakening”—a spiritual revival they see as a necessary precursor to political “reformation.” Davis is not the only one counting on the MAGA movement. Other Religious Right groups have met in the Trump International ballroom and prayed for God to defeat Trump’s supposed enemies in the FBI and Justice Department, and to sweep pro-choice justices off the Supreme Court so Trump can replace them with jurists believed to be poised to overturn Roe v. Wade.